It's no surprise that U.D.O. chose Moscow to document the current lineup, which is running on a high since the release of Steelhammer in 2013. Why Moscow, one might ask? U.D.O. has a special relationship with Russia, as they toured extensively behind the "Iron Curtain" well before many other bands evidenced by Live from Russia (2001) and the song and video "Trainride In Russia (Poezd po Rossii)" from 2004's Thunderball. Steelhammer - Live From Moscow puts Udo Dirkschneider's immediately reconizable and polarizing atonal wail front and center; love him or hate him, he sounds just about the same as always. It's actually quite a remarkable feat considering his age and the miles on his voice. Also onboard for the proceedings is the veteran rhythm section of Francesco Jovino (drums) and Fitty Wienhold (bass); they hold it down admirably. The guitar department features Andrey Smirnov (who, incidentally, hails from Russia and recorded all of the guitars on Steelhammer) and Kasperi Heikkinen (came on board in time for the Steelhammer tour cycle via his native Finland). Both joined U.D.O. in 2013 after the loss of guitarist Igor Gianola and longtime guitarist/songwriting partner/producer Stephan Kaufmann. Andrey and Kasperi are both excellent players who have nimbly adapted to the band's framework by playing the material faithfully - while showing off their individual chops. For a new team, they exhibit some smooth interplay in the form of harmonies and tradeoff soloing. The touring lineup is rounded out by keyboardist Ulli Köllner, who provides background vocals, rhythm section support, and additional harmonies and melodies (and based on some live videos, a lot of enthusiasm!). Purists can relax, as the keyboards never overshadow the core guitar sound. True to the CD's title, Steelhammer is well-represented, covering a third of the CDs tracks ("Steelhammer", "King Of Mean", "Cry Of A Nation", "Never Cross My Way", "Stay True", "Metal Machine" and "Devil's Bite"). As with any live disc from a band with a large catalog, fans can quibble about the remainder of inclusions and omissions; "Thunderball" is noteworthy by its absence - but that's a personal disappointment. It's a two-disc set, and while disc one is no slouch, disc two is where U.D.O. really turns up the "Burning Heat" and provides a block of nine high-energy tracks. "No Limits" comes across particularly well, and "Mean Machine" also deserves a mention; somehow, two extended guitar solos and a drum solo hold interest and don't drag down an excellent rendition of a classic track. "Metal Heart" is the obligatory ACCEPT song in the role of closer, and yes, they did a convincing job with it. 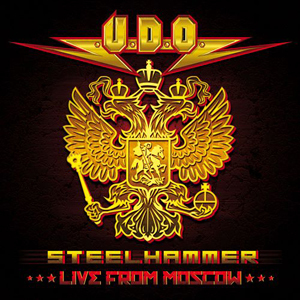 Thankfully, Steelhammer - Live From Moscow focuses on Udo's solo material. At this point, he has released more music on hisown than he did with ACCEPT; since both bands are running strong (and U.D.O. having kept those songs out there when there was no ACCEPT), it's unnecessary to retread that familiar ground. As far as the production quality and sound, it's pretty darn good. In your face and real, but with the polish that you would expect from players at this level. All of the instruments are audible and balanced (like a good live mix should be), but most importantly, the material is strong and well-executed - and that's really the point. Performance counts and goes a long way towards making this very listenable and sonically pleasing for what it is; a straight-ahead, "balls to the wall" dose of German-style classic metal. The gist is that Steelhammer - Live From Moscow accurately captures the energy and spirit that U.D.O. displayed during their 2013 North American tour. Collectively, U.D.O. sounds energetic, professional and in top form - like they have something to prove. Whether or not the extremely successful ACCEPT reunion plays into this can be left to individual speculation, but point made that U.D.O. can still bring the metal. High hopes that the next studio release is a worthy follow-up to Steelhammer and fulfills the promise shown by this lineup in a live setting. 4.0 Out Of 5.0 on the "live album scale"
Pick up a copy of Steelhammer - Live From Moscow in the KNAC.COM More Store right HERE.